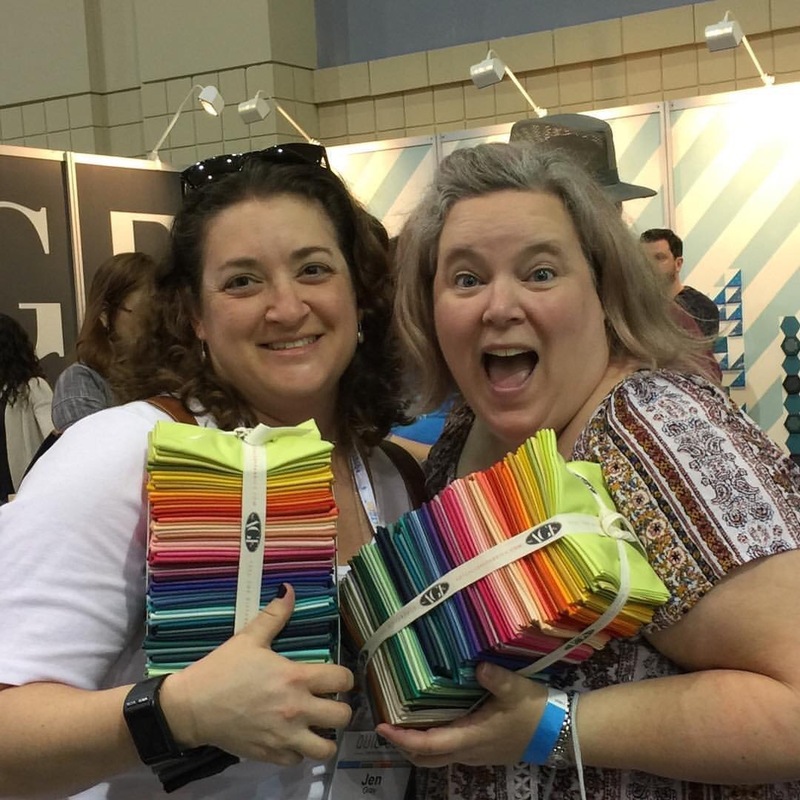 In looking at the quantity and quality of vendors, there appeared to be a robust market experience at QuiltCon. However, given this is my 3rd QuiltCon, I think the vendor experienced has deteriorated. There were lots of manufacturers and some of them put a lot of effort into making it fun and informative for the quilters in attendance. 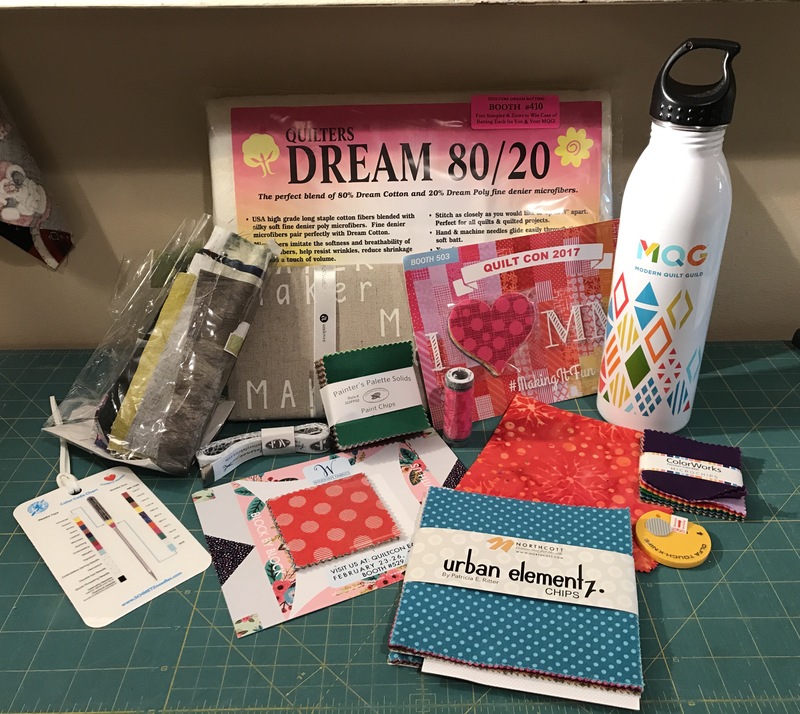 I appreciate the goodies, from the Modern Quilt Guild and also from all of the sponsors. The Aurifil Thread puzzle game was fun, but probably took a little too long. I do appreciate the thread prize though. I also loved their thread spool quilt! Art Gallery Fabrics had a great booth too. They were highlighting their solids and the solids were the focal point. There were two ways to win, and my two friends Jen and Amy won fat quarter packs. As great as that was, there were too many Spin to Win scenarios throughout the show. 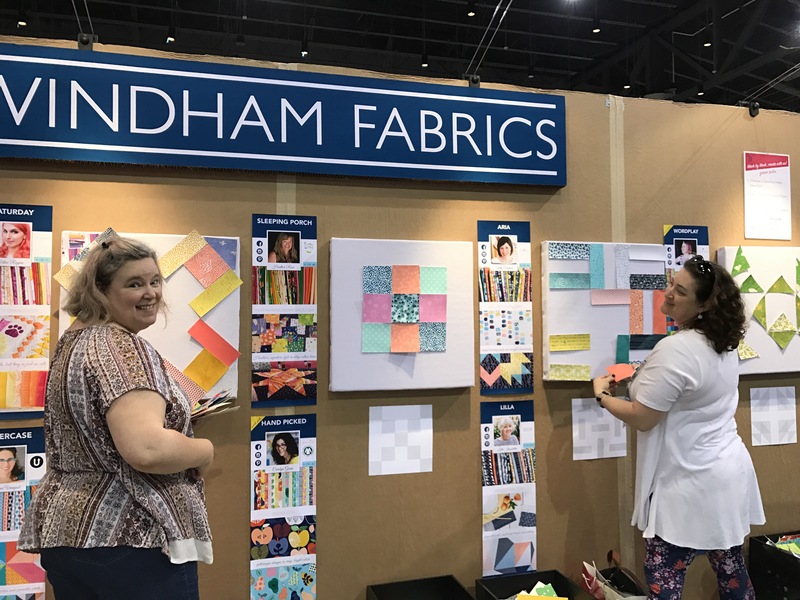 Windham Fabrics had a cute game where you would build a block, take a photo and be entered in a contest. While I appreciate the barrette they gifted, a chip pack or fat quarter would have been better and would likely gain more traction while people made things and posted about it. The last booth to highlight is Marcus Brothers. 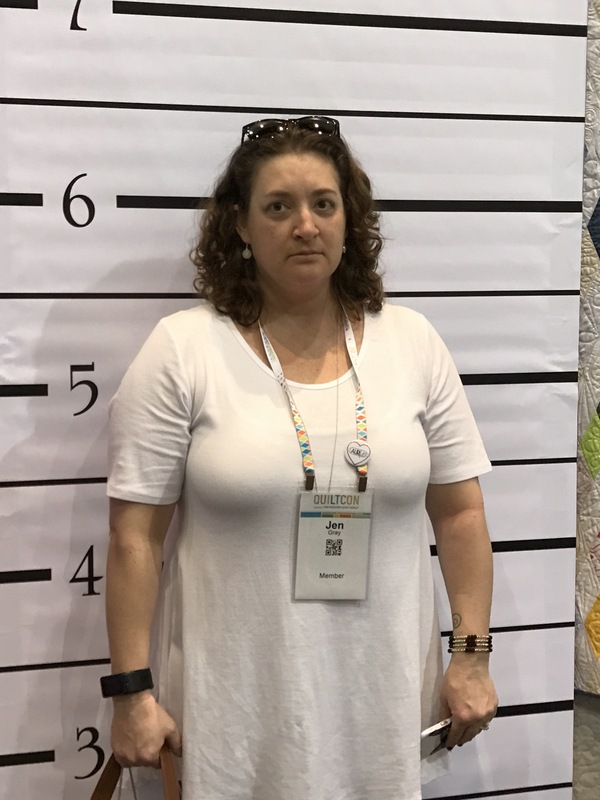 Beyond the cute “mug shot” they allowed folks to take a piece of fabric to make a mug rug. Get it? Jen had a lot more fun than this shot would suggest. I did miss the fun with some of the big manufacturers. Robert Kauffman and Moda have both had more interactive experiences in past years. I have the Moda tea towels I was gifted two years ago on my sewing room wall and I do reference it for tea towels. And I was looking forward to seeing more of the Kona color of the year this year, and was bummed. There were several booths that had sewing happening and that was on point, but just too crowded to participate. The shopping was great. 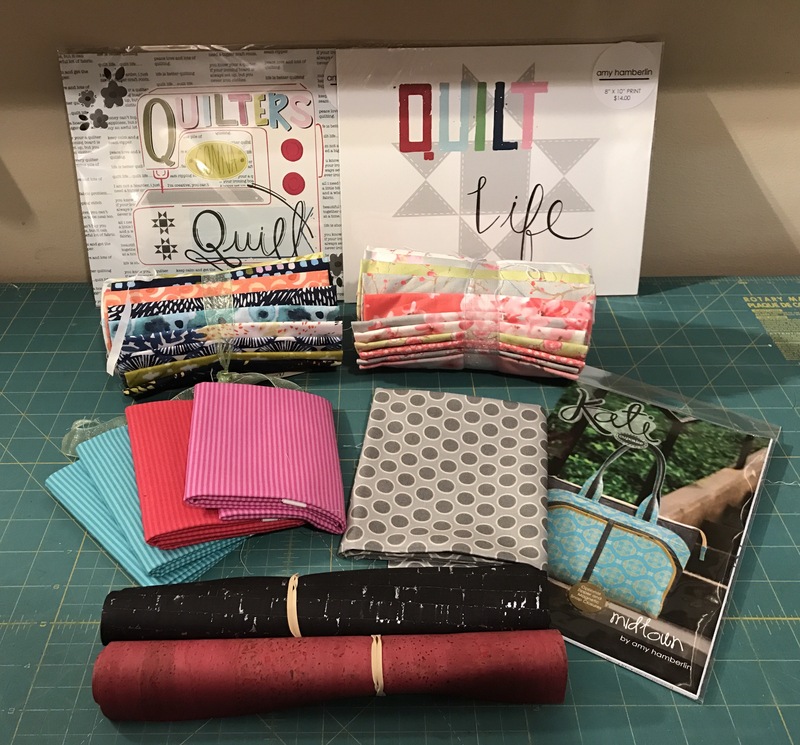 I don’t have many quilt ships in quick driving distance, only one really, so shopping the vendor market is a highlight for me. 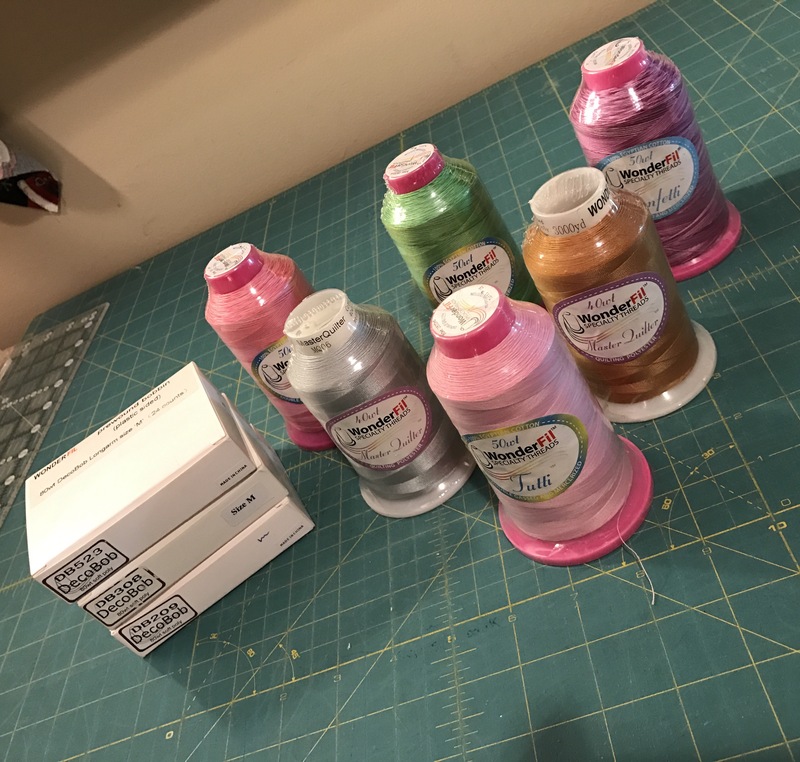 I got some great thread from Wonderfil, and am very excited to bust into the variegated pinks. One of the Main things I wanted to get was a full set of Allison Glass Sun Prints. I couldn’t find them anywhere until the second to last vendor I visited. And here they are. Wow! I always love seeing the AdornIt girls and got a few yards from the too. 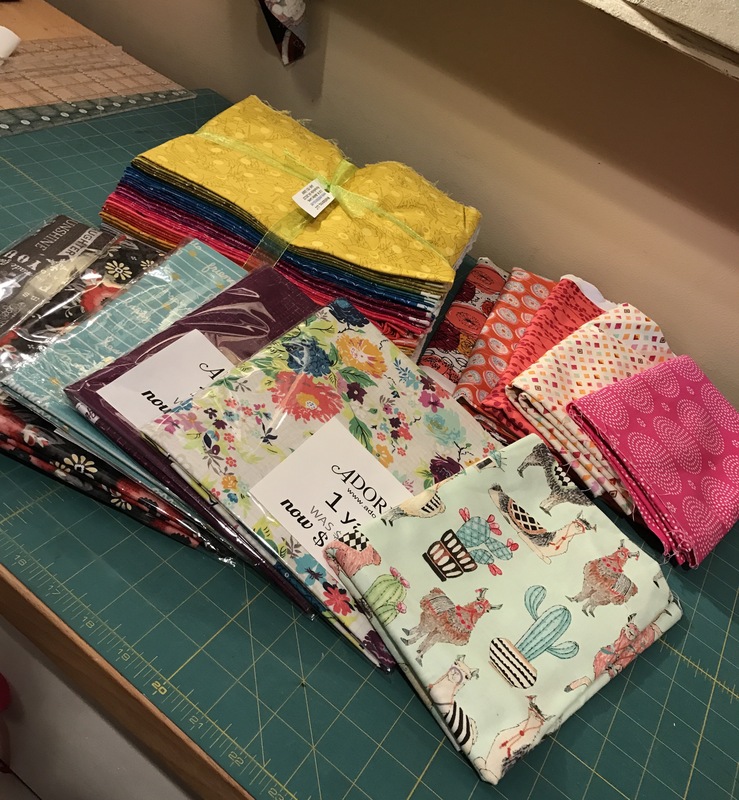 I picked up a few other yards here and there as can’t wait to start sewing with these goodies. I am so thrilled with all of the fabric I found but have to share this one. 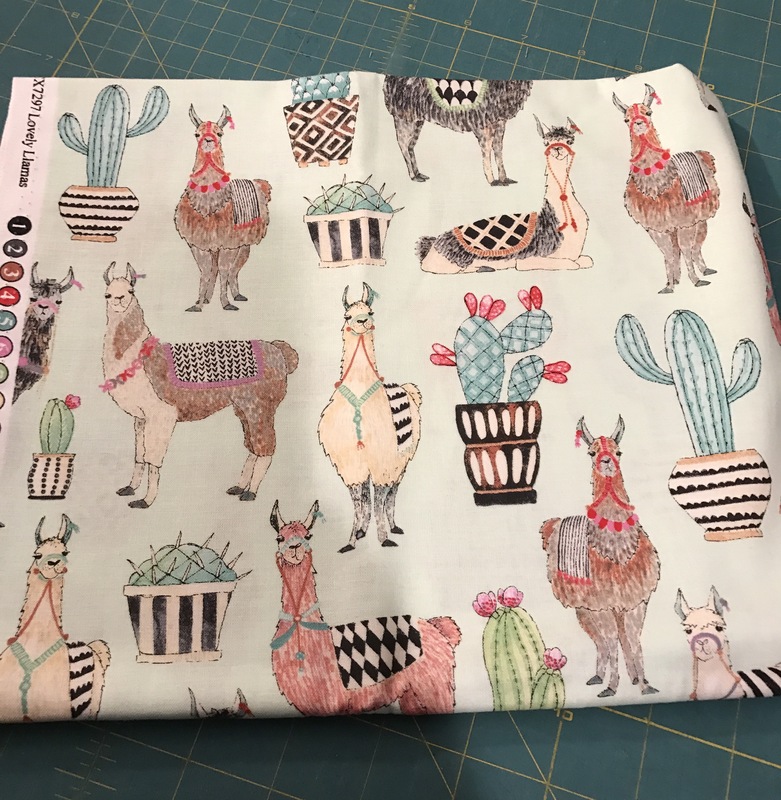 Llamas? And cacti?Amazing find by Michael Miller. Can’t wait to make something fun from that! 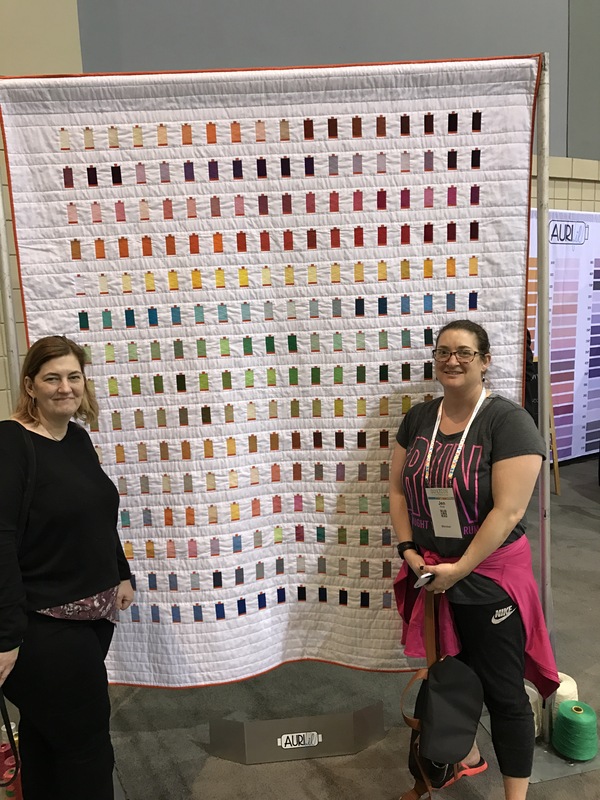 Well that is a wrap on my QuiltCon posts as we didn’t do lectures or classes this year. I hope you enjoyed the posts, and have enjoyed seeing everyone’s photos on Instagram. Jen, Amy and I did some gallavanting in Savannah and I will share that later along with shop reviews on the three fabric shops I visited. 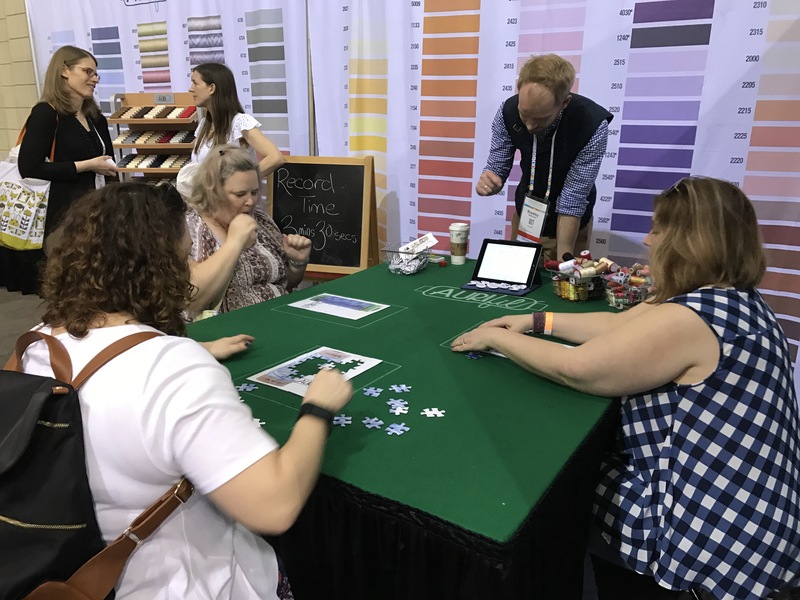 I really appreciate the sharing by those who attended QuiltCon2017. I would have loved to be there! Having worked many shows in my career, I can see that it is difficult to beat the previous shows as far as fun, information and all. Glad you found your fabrics! Happy Sewing! Happy sewing to you too! It is always fun to see the shows, but fun to get home too! That was really interesting. I was there this year, with a friend, and it was our first QuiltCon, though we’ve both attended all the major US shows in the past. 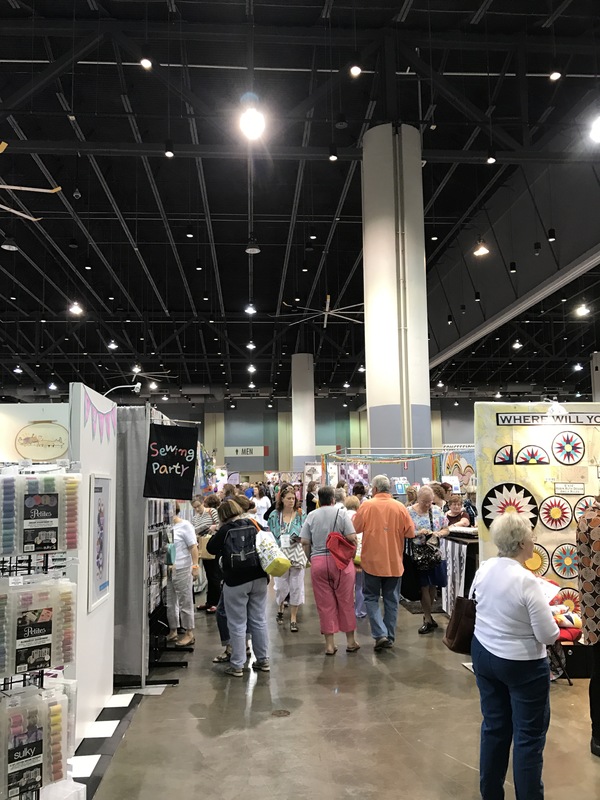 I really enjoyed the experience and the quilts, though I didn’t think there were as many selling vendors as most shows have, and there were more manufacturing vendors than most shows have. It was both refreshing and new to see quilt vendors from a different point of view. Now reading your post, I see we had completely different experiences. =) There’s not a thing wrong with that!